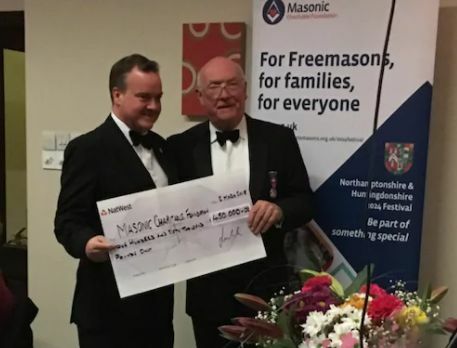 On the evening of March 2 , the Peterborough Masonic Hall hosted the launch of The Province of Northamptonshire and Huntingdonshire Masonic Charitable Foundation (MCF) 2024 Festival. This is a charity fundraising initiative that will last for six years, during that time Freemasons in The Province will raise £2.024m for Masonic Charities, which provide support not only to Freemasons and their families, but in addition, awards millions of pounds each year to local and national charities that help the vulnerable, advance medical research, and provide opportunities for young people. Local recipients in Peterborough have included Riding For The Disabled and the Sue Ryder Thorpe Hall Hospice. The money to be raised is spread across each Lodge in The Province, and the different targets take into account membership numbers apportioned to each. Over the next six years, until the Festival closes in March 2024, there will be a number of charity fundraising events across The Province, so watch this space for news of events in Peterborough.